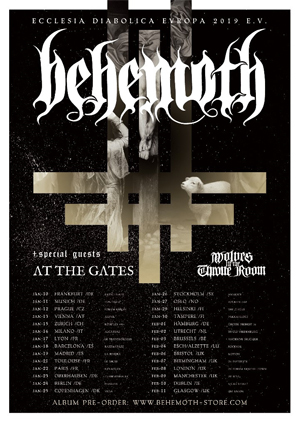 After recently completing a North American headlining tour with AT THE GATES and WOLVES IN THE THRONE ROOM, BEHEMOTH is bringing this must-see show to Europe! In anticipation of the trek, the band has also launched a new video for "Ecclesia Diabolica Catholica" (directed by Grupa 13 / http://www.grupa13.com), taken from their latest album, I Loved You At Your Darkest. Watch the clip on KNAC.COM HERE. Orion (bass & vocals) comments: "BEHEMOTH Legions! As this ILYAYD adventure continues onwards, we want to share a new video with you! Since we began the writing process, "Ecclesia Diabolica Catholica" was a stand-out contender to be featured as a single and music video. As the song evolved during rehearsal and recording, it gained this lively, furious vibe...which you hear now - thus, it includes live performance elements which we've not done in quite some time. We are happy to work with Grupa13 once again - and once again, they showed their super-professional approach at every step of the shooting and video production. Two separate locations, hours of preparation, but it was all worth it. In absentia dei, we evangelize! Enjoy!"